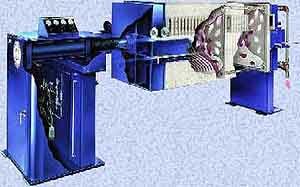 These filter presses are used for solids dewatering such as solids in a clarifier, and coarse filtration, where a large volume of solids will be trapped while maintaining high flow rates. According to the manufacturer, these presses offer high surface area filtration and a very low percentage of moisture content in the caked solids. The average cake dryness is 20-30%. The presses use applied pumping pressure to separate liquid content from slurries, sludges and other liquid/solid solutions. Retained solids are compressed into dry manageable cake form. HydroCal, Inc., 22732 Granite Way, Suite A, Laguna Hills, CA 92653. Tel: 949-455-0765; Fax: 949-455-0764.